On Saturday, July 26, Warner Bros. will have a massive 3-hour event at Comic-Con International featuring the screenings of both the Gotham and Flash pilot episodes, scenes from Constantine, and cast/crew appearances. Sadly, this means I won’t be able to attend the event, as I don’t have Saturday tickets. On the plus side, I also don’t have to worry about spending 4 hours waiting in line and getting shut out, so that’s 7 more hours of convention I can actually go to. Now that I think about it, I might be getting a better deal. This entry was posted in Flash News, Media and tagged Flash TV Show 2014, SDCC, SDCC 2014, TV on June 30, 2014 by Kelson. IN THIS ISSUE: Flash vs. Fauna of Equatorial Africa! This entry was posted in Annotations and tagged annotations, Barry Allen, Big Sir, Carmine Infantino, Cary Bates, frank mclaughlin, Gorilla City, The Rogues, the trial of the flash on June 28, 2014 by Greg Elias. This entry was posted in Reviews and tagged Andrew Dalhouse, Brett Booth, Future Flash, Norm Rapmund, Robert Venditti, Van Jensen, Wally West on June 25, 2014 by Ed Garrett. 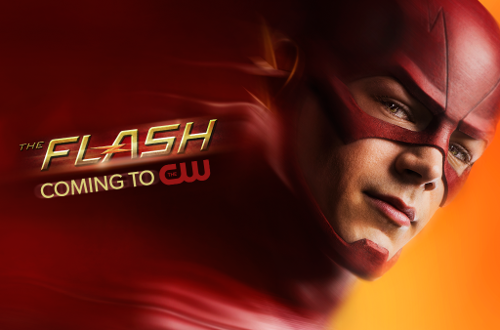 The US debut for the first episode of the Flash TV Series is set for October 7. To help get you up to speed (so to speak), CW will be airing the two-part “Arrow” episode introducing Barry Allen the previous week. They also plan encore showings of the first two episodes. Rumor has it that CW will be screening the pilot at Comic-Con International next month in San Diego. I’ll try to make it to the presentation if it’s on one of the days I’m attending. The pilot has apparently leaked online. No, I haven’t watched it. This entry was posted in Flash News, Media and tagged Flash TV Show 2014, TV on June 25, 2014 by Kelson. Flash #32 arrives in stores this week. 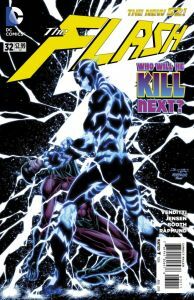 The future Flash continues working his way back into the past, this time paying a visit to Captain Cold, while in the present day, Barry Allen investigates the theft of super-villain weapons from police lock-up during the Crime Syndicate’s reign. Plus: What’s up with the speed force? Van Jensen, Robert Venditti, Brett Booth, Norm Rapmund. Preview at Complex. “Race of Thieves” continues in Catwoman #32, with Glider and Mirror Master guest-starring. And in digital back-issues, DC is adding two more issues to the backlist: Flash #239 and Flash #240, parts 2-3 of “Fast Money.” Could cashing in on his fame be the way to solve Wally West’s money problems? Probably not, if Spin turns public opinion against him. And what’s Grodd doing in all of this? Tom Peyer, Freddie Williams II. This entry was posted in Out This Week and tagged Preview on June 24, 2014 by Kelson. Interview with Mark Waid at HeroesCon 2014! We talked with writer, publisher and comic shop owner Mark Waid at HeroesCon 2014 on behalf of TMStash and Speedforce.org about Thrillbent Comics (check it out! ), the continuation of EMPIRE at Thrillbent, his take on THE FLASH (including both his take on the New52 Wally West and his comments about the name of the Speed Force itself), Foggy’s health issues in DAREDEVIL and more! Don’t miss this interview with Mark Waid (just click on the link below)! Just a note for Flash fans who cannot wait for the Flash-related questions, they start at 3:23…but honestly you should catch the whole thing…and don’t forget to check out Thrillbent.com! This entry was posted in Interviews and tagged Daredevil, Doctor Spektor, empire, Flash, HeroesCon, HeroesCon 2014, Mark Waid, thrillbent on June 22, 2014 by Ed Garrett.